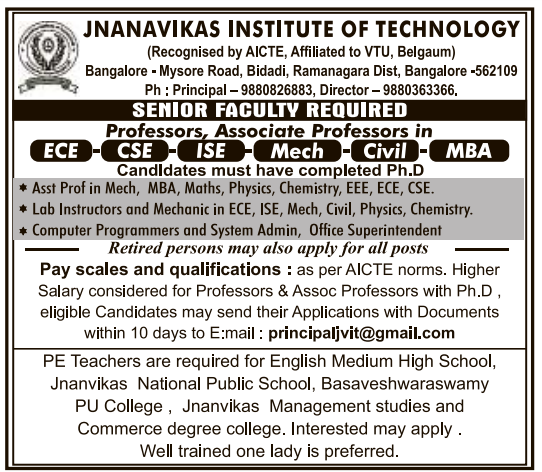 Jnanavikas Institute of Technology, Bangalore has advertised in the DECCAN HERALD newspaper for the recruitment of Teaching Faculty- Professor / Associate Professor / Assistant Professor Plus Non-Faculty jobs vacancies. Interested and eligible job aspirants are requested to apply within 10 days from 27th June 2018. Check out further more details below. About College: JnanaVikas Institute of Technology, is one among the foremost institutions in technological education. The Institute was established in 2001. It is approved by AICTE, New Delhi and affiliated to VTU, Belgaum. How to Apply: Interested and eligible candidates are requested to send application along with CV, copies of certificates (including PAN card, Aadhaar card) and recent passport size photo to the email address or postal address given below.